Kathy Holmes is an independent spiritual teacher devoted to transformation and growth through yoga and 12 Step recovery. Since 1995 and throughout her professional training, Kathy has had the opportunity work with many of the leading yoga & meditation teachers of our time. She has traveled to India over a dozen times studying with master teachers. Over the past 20 plus years Kathy has developed a unique blend of spiritual teachings, yoga and 12 Step recovery to assist others on the journey of awakening. As a Recovery/Life Coach and a spiritual mentor she empowers her clients to have breakthroughs and gain new perspectives. 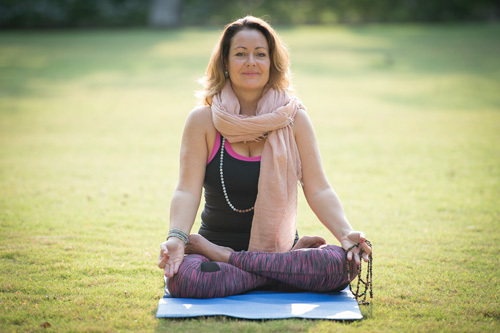 Her teaching is rooted in her experience and knowledge of Hatha Yoga and in the philosophy that the peace and fulfillment we seek can be found within. We all have the Divine right to live happy, joyous and free. Kathy lives in New Hope PA with her husband John and their 2 dogs Stella and Forrest. Their oldest son Josh lives and works in Boston MA and their youngest, Max is attending UBC in Vancouver Canada.